Made from strong, yet lightweight titanium, this design keeps drinks cold (or warm) for hours. Your nightly glass of water just became a big deal. 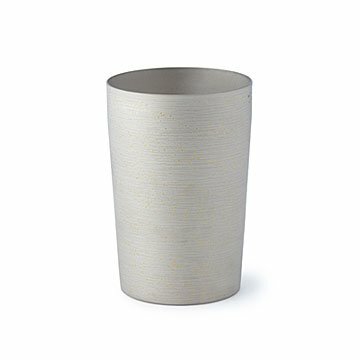 Made from strong, yet lightweight titaniumthe same stuff we use to build airplanesthis sleek cup boasts an ultra-thin double wall design that keeps drinks cold (or warm) for hours. It's nice to look at, too, and will stay that way, since what it's made of doesn't rust. Think of it a little like the 747 of cups: a landmark design that's built to last. (A real 747, by the way, incorporates roughly 45 metric tons of titanium. That's a lot.) Made in Japan. * Do not place tumbler beside the fire, as the cup becomes hot and there might be a possibility of a burn. * Do not use tumbler directly on the fire, and also not use in Oven or Microwave. * Please do not use dishwasher when washing this product. *Do not use strong sticking tape on the titanium surface. * For the first usage, and after each usage, wash lightly by sponge with neutral detergent, and dry well. *Please refrain from cleanser or polishing powder, as they may be a reason of discoloration.